Nothing—not the permanent vermilion mark on his forehead; not the myriad visits to temples and mutts; not the prostration before swamijis and godmen; not the advice of astrologers and numerologists; not the maata-mantra; nothing—could eventually save former Karnataka chief minister, B.S. Yediyurappa, from the clutches of man-made law. Here, after the Lok Ayukta special court rejected his bail plea and issued an arrest warrant in connection with the corruption cases registered against him for illegally denotifying land in and around Bangalore, the ex-CM leaves the court premises in Bangalore on Saturday with a wry smile. The court sent him to judicial custody till October 22. Also read: Do Yeddi & Co have no faith in State temples? Should netas swear before god in secular India? Is Janardhana seve Janata seve in Kumaraswamy book? CHURUMURI POLL: Black magic in Silicon Halli? This entry was posted in Issues and Ideas, Kannada & Karnataka, Media and tagged B.S.Yeddyurappa, B.S.Yediyurappa, BJP, Churumuri, Karnataka Photo News, KPN, Lok Ayukta, Lokayukta, RSS, Sans Serif. Bookmark the permalink. ← CHURUMURI POLL: Will BJP dump Yediyurappa? Still it is a long way to go. It is only judicial custody now. One is not sure whether he will be punished for his misdeeds or not? Who khows he may come out unscathed one day and take out a Yatra for eradication of corruption. I simply dont understand how Indian Judiciary can just send anyone to jail before the case is even proven. Bizzarre system we have in the name of civilized democracy. Unfortunate. If tomorrow Gujarat/ Madhya Pradesh Governor were to do a Bharadwaj on Modi / Chauvan and so on what will happen to Indian Polity ? If in a similar vain if President of India can give permission to prosecute to PM, what will happen to the country ! With the plethora of scans center is engulfed, most of the cabinet will have to go to Tihar Jail and PM cannot escape as he has acquiesced with the guilty even if not guilty of any personal gain. Logically speaking all Chief Ministers of the country who gave exemption under S-20 of the ULC Act to the owners who had excess vacant urban land are all without an iota of doubt are corrupt. This is no defense of Yeddi ! But the fact remains he was rendered horse de combat by a unprecedented act of a Governor who – in the not so distant past had allowed Quottrochi to escape. We all know how CM’s like Lalloo and Jaya made triumphant return power after cooling heels in the jail despite the cases being undecided. So we need a balanced way dealing with Political corruption and this penchant for courts to make them tax payers guests should end and at the same time there is need for a time bound way taking the cases to a logical conclusion and at the same time they need to disqualify them from electoral process. yeddy’s brazenness reminds me of a spoof from an old i.s. johar movie targeting the congress leaders’ nepotistic corruption during the emergency. yeddy has pulled a congress on karnataka’s voters. he has cast a long shadow on the politics of the great state of mokshagundam visvesvaraya. he has raised the stakes for his successor, d.v. sadananda gowda, who is by many accounts an earnest, diligent politician. somebody has said, “when small men cast long shadows, it is a sure sign the sun is setting.” yeddy being karnataka’s top newsmaker doesn’t bode well for our state. Exactly as predicted all this is a well-planned gimmick to fool the public, despite the commendable efforts of the Lok Ayukta and Lok Ayukta police! Thanks to the discrete help of the other sincere and most honest, self-service sanghachalak Sadananda Gowda, Yeddi is now in the VVIP luxury of another noted hospital in Blr. And will be in the safe confines of his home in days. You can expect another ‘yatra’ to various temples, swami’s, mutts and astrologers very soon. With the next Lok Ayukta post being intentionally delayed by the Govt with a dozen excuses, so-called discussions…et al, the misdeeds, self-service and rampant corruption of the current CM, his real-estate businessman son, Ministers and MLA’s feverishly continues unabated. Anant Kumar, Sushma Swaraj who were closely associated with Reddy brothers? HDK & family?…..
Looks like top rung of both Congress and BJP will remain unscathed by letting the public focus elsewhere. Both are operating by MAD (Mutually-Assured-Destruction) principle? 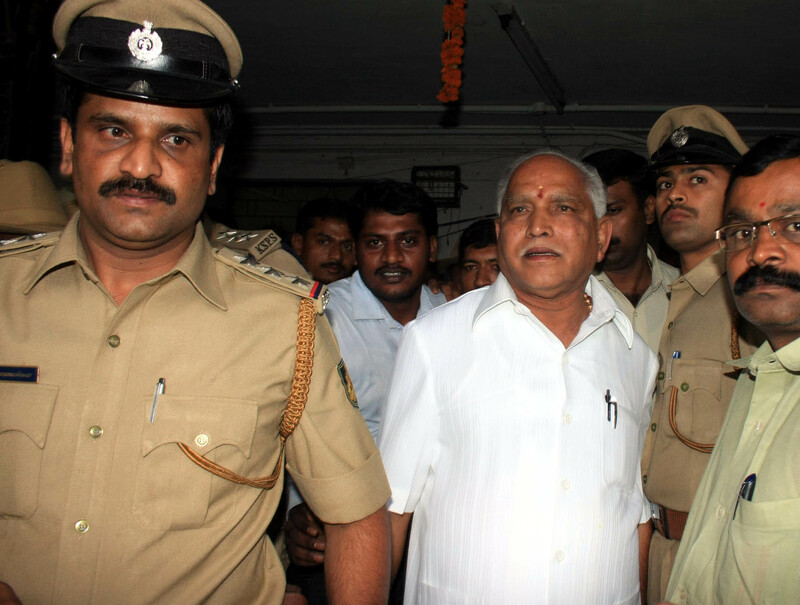 BSY is not sentenced & sent to jail. He is *judicial custody* – held on the order of a judge – not necessarily charged with anything by law enforcement. Judge orders *judicial custody* based on some very strong evidence. Not with just a simple written complaint. The lawyer in this case had submitted 1000+ pages evidence against BSY’s misdeeds. I like Yediyurappa ji because he is sober, neatly dressed, he speaks softly, he prays regularly, etc. In any case, his corruption is minor. No self-respecting Congress man would ever condescend to sell his soul for few lousy plots of land. They would like to have an entire city, or something in the tune of 175,000 crores in Swiss Bank for 2G allocation. Yediyurappa ji is a minor fry in the corruption game in the country and that is why he has been arrested. Had he done corruption on a bigger scale, he would never be caught. Unfortunate. Sorry I do not understand Law. I am sorry for Yeddy. But I am happy many BJP types suddenly woke up and realized the dictum – innocent till proven guilty. Wish the same erudition and sense of justice was on display during 2G and CWG saga as well. This was to happen some day……Yeddy has brought shame to BJP……Any political leader be it from Congress/ BJP/ NCP etc etc would do the same thing what Yeddy has done…….Money lures you and spoils you……. Law of Omerta: Wrong on many counts. 1. When did talking softly or praying an virtue of a good person or leader? 2. Corruption is minor? You won’t let off a thief for stealing just your car-stereo as versus the car itself. Evidence suggests he has cheated exchequer of 100s of crores in denotification scam. Minor offence? 3. Congress corruption doesn’t justify BJP corruption. BJP in the state has enabled the mining scam that is perhaps even bigger than CWG scam. I feel sorry that our leaders are crooks and need to be jailed. But, I am not sorry that any one particular leader is jailed. They deserve it, and power be with our judiciary & prosecution to see this thru. We badly need a few people made example of, so the impunity with which people stole public money can be reduced. deshabhukta would be more apt than deshabhakta in the title of this post. @ Nastika: Judge orders *judicial custody* based on some very strong evidence. Not with just a simple written complaint. The lawyer in this case had submitted 1000+ pages evidence against BSY’s misdeeds. .Yes Sir, one is aware of the distinction between judicial/police custody and the actual conviction. But nevertheless the ignominy of a Jail term cannot be effaced. You use the word misdeed based on a press report of 1000 pages submitted to the Governor. If a Governor can decide on his own about the culpability of a person on the basis of a private complaint , then why do we need a Lokayukta ? I would have appreciated if the Governor had forwarded the complaint to the Lokayukta then if the law had taken its course. One is not taking cudgels on behalf of one Yeddy or cheddy here. I only highlighted the futility and inadequacy of law and procedure in dealing with corrupt in the light of the extant status of Jaya or Lalloo and the penchant of lower court judges to send the heavy weights to jail to garner fame and popularity. De notification under LAQ Act is analogous to exemption of vacant land under ULC Act and in booth cases original Notification/ declaration to acquire a property would have resulted in a expropriation of valuable asset of an individual for a farthing ! As any one of us would do, one will use all available legal loopholes to save the asset. This results in the so called denotification/Exemption of the asset from the vices of the LAQ/ULC act. In bot the cases there is cost ( corruption) involved but for the owner of the asset this means he was able to salvage a hopeless situation to atleast 50% of the Market value and invariably grateful to the Politician who supported his cause albeit for a price ! This is happening for the last many decades with impunity. It is only due to the advent of RTI and media trial by politically aligned visual media which has changed the end game and resulted in the recent spurt in eye ball catching breaking news and arrests of honchos. Root cause for most of the ills of the land dealings is the long arm of the State under Eminent domain to expropriate privately held property for a farthing. We need to look at the law and the constitution to remedy the situation. Right to Property which our founding fathers had given as a fundamental right needs to be restored and many amendments done to directive principles need a re look. It is chimera to sustain even after 60 years the dogma of directive principles to perpetuate some outmoded socialist concepts. I am tempted to join the soothsayers, Yed is not the worst we have seen. There will be others. In just one case alone, Yeddi’s direct actions caused clearly documented losses to the tune of Rs 283.46 crore to the state exchequer, while his kith and kin stood to gain by Rs 49.81 crore, all in hard cash! Nothing will happen friends. It is only a sort of joke so that We the (foolish) People can have momentary laughter and feel elated briefly. Please seriously think about this: After 1947, how many scams have occurred till this year, what is the amount of corruption involved in each such scam, how many politicians (and others ) are involved, how much money or property of such persons have been seized, how many of them have been convicted or for that matter how many of them have spent in jail for more than a month? The appropriate title may have been “From DeshaBhakta to DeshaBhukta”. This is just the de-notification case. What about Upper Bhadra case? What mining scam? When will the long arm reach? @maisuru, we justice system is hugely loaded against law enforcement agency, with the motto, let ‘100 culprit escape, lets not punish even 1 innocent’. So, even if 1 person is brought the witness box then its an achievement in itself. True, BSY is a popular leader, but there is nothing to lament in this case. I will produce a 2500 pages relevant documents on how PM doesn’t speak to media, doesnt want to get black money back, how he has repeatedly saved ambani from days of gas row, share market irregularities, sebi fractures ,CWG, 2G , Manipur atrocities, sheela dixit , how he has made whole country depend on wall street and US economy, unbearable inflation ,uncontrollable economy etc etc. He doesn’t have ethics .Will our courts be powerful and brave enough to arrest him? Will they have the courage to book Jayalalitha whose proceedings are also taking place in the city with the same ease? Let them do it and maisuru will not lament. We are fed up seeing our own people getting screwed every time while rest being more corrupt are watching it without any shame. With help of India Shining, Magnificent India campaigns & a few overnight billionaire politicians, the Bangalore Jail now does more ‘business’ than Taj West End! Actually, the politicians have shown the way. When the law is inconvenient, they simply change the law. Like how DVS Gowda’s govt. is going to change the denotification law and MM Singh’s govt. is thinking of changing the RTI. Therefore, in true filmi style, a team of citizens needs to be formed who must take the law into their own hands and eliminate the corrupt in one swift move, and redistribute their illgotten millions to deserving NGOs. At times like this I really admire the Saudi style or China style – execute these criminals who indulge in large scale corruption – set an example and a warning to others. All this legal process and democracy stuff clearly doesn’t work in India. By the way, the “arms” of Law may be long but its “net” is very weak.